I’m MIA a lot, I know, excuses. I was in the audience for the Conan show today. It was fun. Anyways, needless to say, sometimes I’m not great with juggling life and keeping up with writing… but I’ll come back. 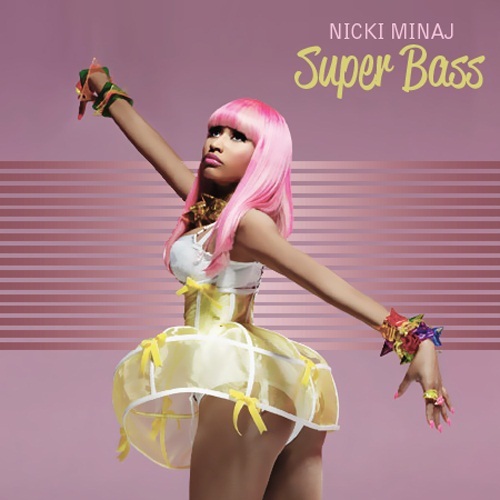 So, on the back catalogue that I wanted to talk about, was Nicki Minaj’s “Super Bass” which is “super-catchy”. The video is cute… with the pink theme all over the music video. I kind of appreciate the gratuitous male bodies in the music video, because it’s a nice change from seeing naked girls EVERYWHERE. Let’s even up the odds a little bit, eh? It’s not really great to focus on body parts, no matter the gender, but the media is geared for the male eye, from female magazines to fashion runways, so it’s refreshing to have a female perspective. I especially like the day-glow bridge in the song. I think music videos have already been playing with light and will continue to push visual limits with lights. I also heard a little bit of the remix Minaj has with David Guetta, “Where Dem Girls At”. I don’t like it. Guetta has the same sound for everything now. He used to be my favorite DJ, and I hate to say I think he sold out. Anyways, I am aware of that song, and yeah, I don’t think it’s that special. I am also aware of Lady Gaga’s latest with Judas and Edge of Glory. I really don’t know what I think of those songs just yet, so I’m sure I’ll get back on that topic in another post. Jennifer Lopez already has a new music video when her song, “On the Floor” is still rotating on the radio. “I’m Into You” Feat. Lil’ Wayne, is a good song. I especially like the breakdown, and it’s such a tease, because that breakdown or sample of a new song coming out sounds better than the song itself. I’ve been wanting to say that for a few months now, but I wasn’t sure if I was too hasty in making that remark. The year isn’t over yet, and hip hop is all over the radio station, so much it’s nauseating how much I can switch back and forth from Eminem to whatever the hip hop artist of the month is. Not to bash hip hop, I do like good hip hop and Tinie Tempah is definitely refreshing, also Diddy and Kanye West have made good hip hop albums, and Eminem did make some good hits, what’s playing on the radio… just feels like I am losing brain cells just listening to it. But, what IS happening in music, and on the charts is the female pop star. Hip hop may be dominating radio, but the girls are dominating the charts, on iTunes, every time I look, I see Adele, Katy Perry, Britney Spears, Rihanna, Lady Gaga with their latest hit. Even Jennifer Lopez, Black Eyed Peas (ok, not, a solo pop star, but Fergie does get a lot of attention), Nicki Minaj, Selena Gomez, Ke$ha, Jessie J, Taylor Swift are making the charts and making a team of female singers not to be messed with. This year, the number one artist seems to rotate between Rihanna, Lady Gaga, Katy Perry and Britney Spears and Adele. The Fab Five in 2011. Their singles get leaked, or audio only samples are shown on Vevo before the official music video is released and their latest dance pop hit can’t help but make number one or a lot of noise on the internet. What’s so intriguing about these artists? They all have an edge, their music is catchy, danceable and they all have some kind of scandal in one way or another. Maybe not so negative a scandal, as Katy Perry, with a wedding to Russell Brand, but definitely interesting and gossip-worthy, and Adele is too new to the scene to have any scandal. She’s also the credible singer, and not a dance pop star, but her music is making waves. New starlets are crawling into the cracks, it seems like daily. Kerli, Adele, Oh Land, Clare Maguire, Ellie Goulding, Skylar Grey, Naomi Scott are these new up and comers that are making a splash in their own way. I decided to do a little experiment. For today’s iTunes 200, I counted up the hits of all the female pop artists (excluding Country, so Taylor Swift and Carrie Underwood aren’t in this recording, but should be noted as they each have a position on the iTunes 200 as of today), and I wanted to calculate who was on top as of this moment. Female pop solo artists make up 20% of the iTunes 200 as of today. Adele and Katy Perry both have 6 songs on the charts, making them the leaders as of this moment. Adele, Katy Perry and Britney Spears round up the top 3 positions. Rihanna, Lady Gaga, Adele, Katy Perry and Britney Spears all together have 21 songs in the Top 200. It’s interesting to see the numbers, I thought I would see more of a percentage, but when you think about it, just for female pop stars alone, it’s a big percentage. There is also a lot of country and hip hop and Glee songs (Glee has 7 songs on the chart). Which Pop Star will reign supreme? Wait until the end of the year to see how it all goes down. For now, I’m enjoying this pop explosion, and looking forward to following up all the newbies on the music scene. Remixes of the Top 3 Songs right now. I didn’t even realize I missed this weeks Blast from the Past yesterday. With moving and a new job and a lot of other opportunities coming up, I don’t think I have my head screwed on straight. For this week’s Blast from the Past, I was thinking of a very special rapper, by the name of Foxy Brown. I have been thinking about her lately because what seems like her latest replacement is Nicki Minaj. I’m glad Minaj is in the rap game for females. She’s great at it, and she’s bringing a sassy flavor with her music, but I can’t help but be reminded of Foxy. So, Foxy, here’s to you.